Jeremy worked for Chief Justice James W. Smith, Jr. of the Mississippi Supreme Court after graduating from law school and gained invaluable insight on how Mississippi’s appellate system works. After his clerkship, Jeremy entered private practice and worked with large and medium-sized law firms representing construction companies, design firms, and other businesses in litigation and transactional matters. He left corporate practice in 2009 and never looked back. When he met his wife, Staci, Jeremy instantly recognized her as his soul mate. Less than a month before Jeremy and Staci were to be married, Hurricane Katrina destroyed their home in Diamondhead, Mississippi. Although it sounds like a bad country and western song (and actually did inspire a decent country and western song), Jeremy and Staci lost virtually everything they owned except for Jeremy’s pickup truck, their two dogs, Jeremy’s first guitar, and a worthless policy of insurance on the house. After the storm, a series of family tragedies made Jeremy and Staci wonder if they would ever be able to get married, but a friend of Staci’s wrote to the Live! With Regis and Kelly show and entered the couple in the show’s wedding giveaway program. Jeremy and Staci were selected to be married on the show out of a group of over four thousand couples. They appeared on the show every day for a week and while they were acting like celebrities, Jeremy and Staci spent time with actual celebrities, like Harrison Ford, Hines Ward, Etta James, and Regis and Kelly. Of course, the wedding was a live broadcast, and a careful viewer would tell you that Jeremy looked nervous at only one point during the ceremony. 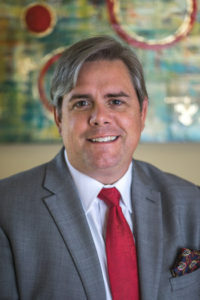 Jeremy has handled family law cases in chancery courts all over the state, and he has extensive experience in circuit and federal court, as well. Jeremy is an adjunct professor at the Mississippi College School of Law, where he teaches Domestic Relations and Current Issues in Family Law. Jeremy was voted Adjunct Professor of the Year for four academic years consecutively, a school record. Jeremy frequently lectures in continuing legal education seminars, and his presentations focus on family law, and technology topics. Jeremy was admitted to practice in 2003 and has been a litigator since 2004. He is licensed to practice before all state and federal courts in Mississippi.